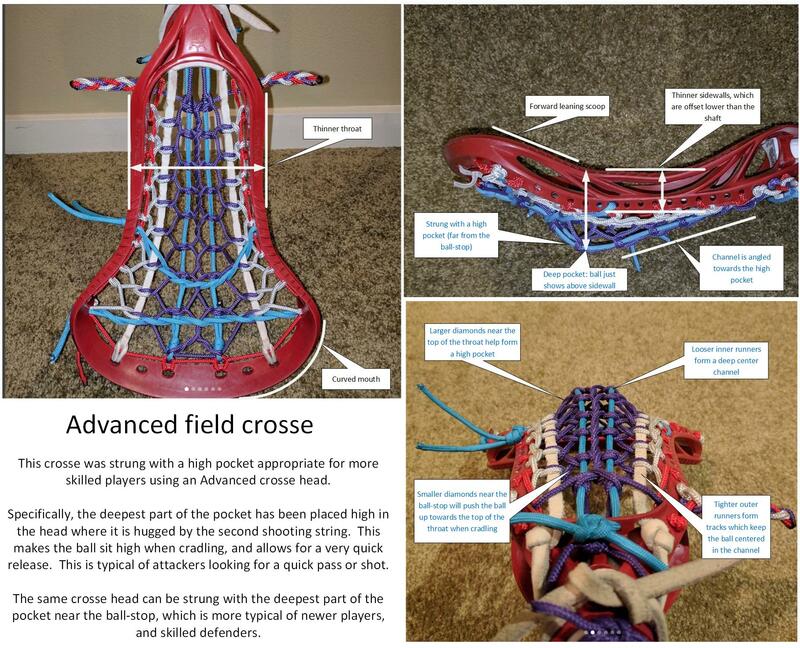 NSI lacrosse recommends advanced field crosses for players U13 and above, regardless of ability. Below are the characteristics of these crosses, and a discussion on the trade-offs between them, to help you identify them and make appropriate decisions. There are lots of rules about stringing a crosse, the most important is how deep the ball can sit in the head. Officials will do a ‘stick-check’ before U13 and above games. U11 players may play with a modified pocket: up to half of the ball may extend below the bottom of the sidewall when the crosse is held level and the ball pressed lightly and released. U13 and above must play with legal crosses: at least some of the ball must extend above the top of the sidewall when the crosse is held level and the ball pressed lightly and released. That is, the top of the sidewall is the important feature for measuring legal crosses. The thinner the sidewall is, the lower the ball can sit it the pocket. Sidewall height doesn’t impact U11 players, as they measure from the bottom of the sidewall. These come in: Painted or unpainted aluminum; rubber-wrapped aluminum; rubber-wrapped or unwrapped carbon-fiber. Everyone can get by with a normal aluminum shaft, the carbon fiber shafts are definitely warming and lighter – or just wear field-gloves to stay warmer in the rain. These are only appropriate for new U11 players, when properly strung with a modified pocket. They are not recommended for higher levels because it is impossible to create a deep pocket due to the thick sidewalls. A beginner crosse is built like a tank, it has a wide flat mouth that scoops up ground balls easily. This is convenient, because new players tend to miss the ball, or get thrown a bad pass, so they are often picking up ground balls. They also get an advantage from the wide mouth because they lack the hand-eye coordination to line up the crosse just-right when running towards and scooping a moving ground-ball. These crosses are built solid, with thick high walls that can take the abuse of ramming the cross into the grass. However, these beginner crosses lack an appropriately shaped mouth for catching and throwing successfully. A flat wide mouth will sit flush to the ground, however, when throwing: it offers no help in guiding the ball. It lacks the curved shape that will help center the ball on release. This means a player could send the ball out of her cross diagonally. It is very, very, hard to hit a target (goal or player) when the ball does not exit the cross in a consistent fashion. A beginner crosse will have high sidewalls, these sometimes help in keeping the ball in the head, but mostly add strength to the head. Ball release can be helped by creating a channel by adjusting the (runner) strings, but this channel tends to lower the ball, which makes it illegal in all levels except U11 (see modified pocket diagram below). When catching, having a centered, deeper, pocket allows the ball to quickly settle into the middle of the cross. It wont bounce around hitting the sidewalls, and will generally sit still while cradling. At U11, because of the modified pocket rules, it is still possible to have a decently shaped pocket while still retaining a legal cross. This is not possible at higher levels, and legal beginner crosses are usually flat, shapeless and hard to control. For a new U11 player, a beginner cross is still appropriate, but care must be taken to properly shape the pocket. 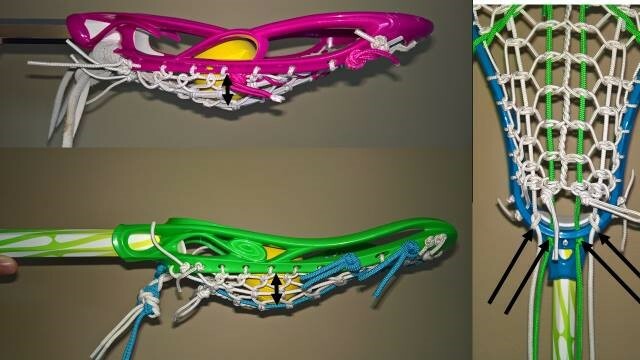 These two beginner crosses are strung for U11, with a modified pocket. On a normal pocket (U13 and above), you must be able to see the ball above the sidewall in all parts of the cross. In a modified pocket, the ball can be as low as half of its diameter below the sidewall (regardless of sidewall height). While this pocket has been lowered simply by loosening the four runners, it has not been correctly restrung: it is simply a lowered ‘net’ and not a formed pocket (more on that below), which means the ball will roll around the whole head and be hard to control. NSI recommends this type of cross for all players and all skill levels. Even purchased new, the pocket will need to be adjusted from the factory stringing to create a channel and set the pocket location. An advanced field crosse has a lowered sidewall, and usually a front-leaning lip that is more curved at the mouth (see black text boxes in the pics below). This lowered sidewall allows for legal deeper pockets, which means more control when catching, cradling, and shooting. The front-leaning lip allows for faster ground ball pick-ups, and the curved mouth shapes the top of the pocket to provide straighter ball releases. We tend to play most games on artificial turf: this reduces the need for a strong and robust crosse head. While heads could still get broken, these is an extremely rare chance of this, even during the few grass-field games we play in a year. That is, there is no need for a robust beginner crosse in our area, the girls are very, very, unlikely to damage their equipment during normal play. The diagram above details both some of the features of the plastic head (in black text boxes) and aspects of stringing (in blue text boxes) used in this head. An advanced field crosse can be strung in many ways, the one above uses two leather thongs for the outside runners, and two nylon cords for the inner runners. The gutting of the crosse uses thinner cords. The technique for the center channel of this crosse is referred to as a pita-pocket. The two center runners can also be a single-piece resembling two runners attached with ties resembling a train-track. In newer (2018) crosses, the two center runners could be a small piece of mesh (looks like the fishnet material in a boy’s crosse). More skilled attack and midfield players may choose to place the deepest part of the pocket near the shooting strings. Newer players and defenders tend to prefer the deepest part of the pocket near the ball-stop. Adjusting the size of the diamonds between the inner and outer runners allows moving the pocket up or down in the head. All of this is possible because of the low sidewall on an Advanced field crosse. Great crosses, expensive, and not required at our level of play. Perhaps the top 5% of players would see an advantage to this type of crosse. These crosses tend to have compound curves in the mouth. They are swept down from the tip of the head to towards the sides of the mouth, they do not sit flat on the ground, and the mouth is leaned forward. They are thinner than advanced crosses and require more hand-eye coordination to connect with a fast-moving ball. These crosses have even thinner sidewalls, and usually have a multitude of stringing holes along their length: which allows them to be custom-strung and fine-tuned for performance athletes. Often use a 10 degree offset shaft and matching headstock, this moves the pocket even further off the center-axis of the shaft: promoting more hold when cradling and more speed when shooting. These are typically a lightweight carbon shaft. 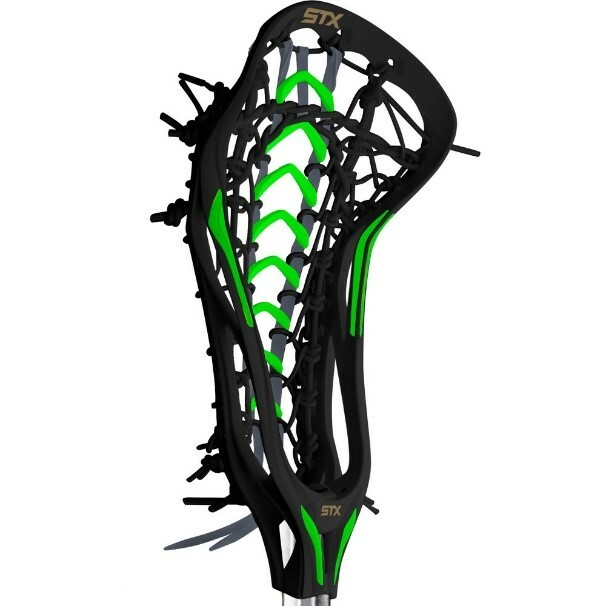 This STX Crux 500 is typical expert field crosse head.